In addition to the above most of Scotland's quality salmon fishing beats have professional salmon fishing staff who maintain the riverbanks and fishing hut facilities in top operational condition. More importantly these are highly experienced salmon men who will gladly give advice on how to catch salmon on their individual salmon beat venues. These professionals can sometimes be personally booked as guides to make sure your salmon fly is being presented optimally at all times. This dramatically increases the chance of sport for newcomers who are not familiar with the exact salmon lies on an individual beat or how to fish a fly effectively. In recent decades many salmon fishing agents have steered many potential Scottish salmon fishing clients away to more remote areas of the world where salmon stocks haven't been as exploited or mismanaged which is great too. 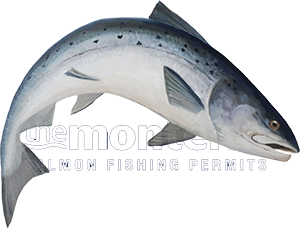 In my professional opinion though you've got to look at the whole picture and take a measured look at all the other attributes that make up an enjoyable salmon fishing experience. Scottish salmon fishing in my opinion has a fantastic balanced blend of attractive components other than having a fair chance of a fish or two without being stuck out in a camp for a week in the middle of the wilderness. If catching salmon was too easy and not a tactical challenge then the satisfaction of success wouldn't be as rewarding. Testing your skills in Scotland against a creature as unpredictable as a salmon is a big part of the attraction especially when paired up with quality accommodation and well maintained riverbanks that aren't miles away from civilisation. What I'm trying say here is that Scotland is indeed a fantastic global location for a salmon fishing trip and this is made even better if you're consulting with an agent who represents only the best salmon river fishing venues and has carved a solid reputation in the industry based on decades of full time professional daily river life and not hearsay. Salmon fishing in Scotland on some of the world's most famous salmon rivers is always going to be something special as is the amazing Scottish river scenery and individual natural beauty of each river. Planning a multiple Scottish river salmon fishing itinerary is something that can also be arranged for clients which really does provide an amazing insight into the beauty and excitement of our famous Scottish salmon rivers. A guided day or two on the rivers Tay, Spey & Dee will create a salmon fishing memory that will remain a permanent one and make no mistake about that fact.